Our second guest blogger is Lindsay from Chesterfield Sling Library who shares with us her advice on wearing your little ones through the toddler years and beyond! Once your baby starts getting mobile, I’ve found that people tend to be more opinionated regarding you carrying them in a sling. On numerous occasions I’ve had, “Oh, they will never learn to walk like that!” (all four of my kiddo's have walked between the ages of 9 and 12 months) or, “that must really hurt your back” (erm nope - the slings I use are made to be comfortable AND supportive, for baby and wearer). It seems that it's readily accepted that a toddler can be pushed in a pushchair/stroller but not be carried in a sling/carrier. Well, I’m here to tell you that when your little one becomes mobile and wanting to toddle about, babywearing really comes into its own ... toddlerwearing is just as fab, if not better in some ways than babywearing! When little one first starts to walk-they want to walk EVERYWHERE! How often have you seen a toddler screaming because they are being made to sit in a pushchair, or they would rather walk, or you see a parent/carer getting all stressy because the toddler is walking, but they still have to push a pushchair? Having a carrier is so much easier! You can pop your toddler in and out of your wrap/carrier and when you’re not using it, fold or roll and pop it into your bag. You can even keep a ring sling draped over you when not needed - no problem at all and a short wrap can double as a scarf. Toddlerwearing allows your child a sense of freedom, as well as knowing they can still be carried when their little legs get tired, it’s too busy for them or they just want a cuddle. It’s also great for parents or carers – no more dragging an empty pushchair around! .. 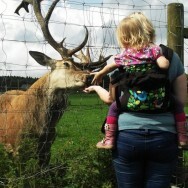 I must admit that I use a mixture of all of them (one of the benefits of running a sling library and having to 'know' the different slings) but even one good toddler carrier can make a huge difference to your adventures!